I teach a combination first-second grade class in a small school. Gynzy was introduced to me this past fall while I was in another teacher’s classroom. That classroom had a Smartboard; I do not. I began asking myself how I could bring some of these fun- interactive lessons back to my own students without using an interactive whiteboard. My classroom has a laptop that can be connected to an LED flatscreen. Gynzy can be accessed on the laptop and projected onto the screen. Each morning the class gathers on the carpet in front of the screen and start the day off with by using the morning routine tool. I use this tool to practice the calendar, weather and number sense skills of the students. During this meeting, the leader of the day will click-and-drag the date into place to practice. After that, we continue the morning routine to talk about the weather by using the weather graph. The last subject of the morning routine tool is to practice the number sens skills. By counting the number of days of the year, students can tell how many hundreds, tens, and ones there are needed for that particular day. The students benefit from the practice and challenge, especially using the alphabetical order and also place value. It allows me to see who may need additional practice or instruction on clock reading or ABC order. Gynzy morning meeting is a fun way to start the morning. A second way that Gynzy is used in my classroom is to reinforce skills. During Reading Café, a group may practice word skills using one of the Winter Activities, such as how many syllables, word-picture matching, or beginning sounds. The group simply takes turns doing the rotation of words provided in the program. One feature that I really like about this program is that it does not have a formal “end” and also, that the activity is self-checking. Another way Gynzy is used in my classroom is for an occasional lesson. For example, I appreciated choosing some of the activities from the Martin Luther King, Jr. lesson. To use a lesson like this, I simply preview the lesson, use chosen sections/pages, and discuss it or do another follow-up activity with the students. 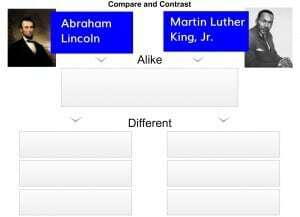 See Sharon Riddle’s blog post ‘Ready to go to Martin Luther King Jr. lesson plan‘. Finally, my students love the Gynzy version of “Hangman” as a reward, part of an indoor recess, or personal free time. My students are inquisitive, active, and love technology. Therefore, I want to set up times when more individual students can use Gynzy to explore and practice skills and interests in a safe, interactive environment.